Keith Christensen is a designer and artist. He enjoys games, seeing and helping students see. His work has been selected for various public art commissions including at The Hiawatha Light Rail Public Art Program at Government Plaza (Minneapolis), The Neuberger Museum of Art’s Public Art Biennial (SUNY Purchase, New York), Colonial Gardens Park (St. Cloud), Minnesota Correctional Facility-Faribault (A Minnesota Percent for Art in Public Places project). 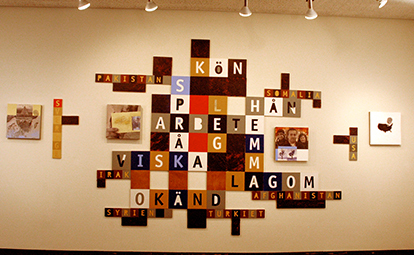 Mural commissions include for the Czech Paralympics training facilities in Nové Mesto nad Metuji, Czech Republic and a mural about the St. Paul Labor Movement for the St. Paul AFL-CIO. He has exhibited his work at Konvikt Gallery, Palacky University (Olomouc, Czech Republic), the Impact International Printmaking Conference (Berlin, Germany and Poznan, Poland), Brecht Forum Gallery (NYC), MCAD (Minneapolis), Form and Content (Minneapolis). Graphic design and illustration clients have included Monthly Review Press (NYC), ArtNews (NYC), Public Art Review (St. Paul). His work is in collections at the National Museum in Poznan, Poland and The Whitney Museum of American Art, NYC. He was a Forecast Public Art Project Grant recipient and a finalist for a McKnight Project Grant.